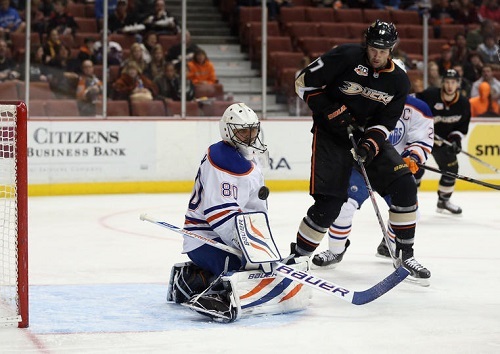 The Edmonton Oilers faced the Anaheim Ducks at Honda Center on December 15th. After inconsistent performances over the past few games (to put it nicely), Edmonton sat Devan Dubnyk out and put Bryzgalov between the pipes to face the Ducks. It proved to be a good choice just a few minutes into the first period, as he managed to make some great saves to kill the Ducks’ power-play. A little more than halfway into the first period, a shot by Taylor Hall was tipped in by Ryan Nugent-Hopkins to bring the Oilers to an early 1-0 lead. However, this didn’t last for long, as Edmonton struggled to keep the puck out of their end. Consequently, it was only a matter of time before the Ducks managed to sneak one past Bryzgalov to tie the game. After a few good chances by both the Ducks and the Oilers, and the Oilers’ first power-play of the night, the game remained tied at 1-1 at the end of the first period. In the second period, the Oilers managed to successfully kill a long 5 minute power-play that Potter garnered for checking from behind and a game misconduct (served by Yakupov). In a way similar to their first goal, the Ducks managed to keep the puck bouncing around the Oilers’ net until eventually one bounced in, bringing Anaheim into the lead. The Oilers’ Ilya Bryzgalov makes a save in the December 15th game against the Anaheim Ducks. Determined for a win after their previous miserable 4-0 shut out by the Canucks, the Oilers put the pressure on in the third period until they were finally rewarded as Sam Gagner tied the game 2-2 with only 10 minutes or so remaining in regulation. The Oilers have been fairly strong in shoot outs, so I think many fans hoped they could at least drag the tie score out into a shoot out, if they couldn’t bury a third goal between the pipes. Well, someone could – but unfortunately it was the Ducks. At the hand of Dustin Penner, a former Oiler, the Ducks regained their lead, bringing the score to 3-2 with only 3 minutes left in the game. The Oilers didn’t manage to tie it up again, and lost to Anaheim. While I understand what he means – Bryzgalov did well in net, and none of the Oilers made huge, blatant mistakes on the ice – his post-game comments are increasingly becoming interchangeable. The Oilers will stay in California a little bit longer in order to face the Los Angeles Kings on Tuesday, December 17th.